As part of the exhibition For Freedoms: Make America Great Again, the University of Louisville's Hite Art Institute and Cooperative Consortium for Transdisciplinary Social Justice present a panel discussion exploring the role, place, and power of public political art using the billboard as a catalyst for discussion. Panelists will discuss their opinions towards the intention/influence/impact of public art and provide insight on how public politicized art can be a used as a catalyst for social change. Panelists include Brianna Harlan, Dr. Annette Harris Powell, and Dr. DeBraun Thomas. Brianna Harlan is a mixed media artist from Louisville, Kentucky. She lets concept and people drive her work, using visual art as a tool for a participatory, reflective, and constructive experience. She has been gaining a reputation as an emerging artist and activist, being selected for the inaugural class of the Creative Capital and Community of Foundation of Louisville's fellowship program: Hadley Creatives; exhibiting in several shows; and receiving an arts residency focused on teaching Meyzeek Middle School students about activism, advocacy, and community through art. Her recent presentation at the Festival of Faiths launch event highlighted the power of art to capture, communicate, and transform. She has also kept busy teaching, curating, and serving/supporting the community through art and her role as a Center For Neighborhoods Community Liaison. She is excited to keep making, learning, and sharing using what she brings up constantly: Radical Vulnerability. You can find her next big work at this year's Festival of Faiths where she will premiere an installation built around wisdom collected from all over the city of Louisville. A second-generation immigrant, born in St. Thomas and raised in New York City, Annette Harris Powell received her B.A. from Amherst College, and an M.A. and Ph.D. from the University of Louisville. A core conceptual theme in all of her work is the rhetoric of place and how it shapes memory in public spaces. Her current research examines the representation of culture through language, images, and structures, expressly the role of statuaries, monuments, and memorials in shaping our collective consciousness and cultural meaning, as well as influencing contemporary discourses. Dr. Powell is on the editorial board of Composition Studies and was a member of the Scholars Advisory Committee for the Frazier History Museum’s exhibit, Spirits of the Passage: The Story of the Transatlantic Slave Trade (2013). Her on-going project focuses on identity, memory, and place in the preservation of indigenous Sea Islands culture. 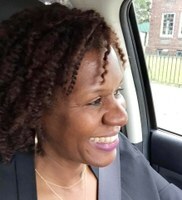 Her writing studies research interests include access, literacy, and place-related issues; specifically, how place shapes civic engagement both inside and outside of the classroom. Dr. Powell teaches classes in writing and visual culture, public rhetoric, and Post-colonial literature, as well as introductory courses in literature. Past courses include cultural rhetorics and writing, writing as social action, and teaching writing. Although her courses are different in purpose and scale, students in her classes should expect to write to learn, to compose their ideas, and to communicate them through traditional forms as well as new media platforms of their choosing. She serves as Director of the First Year Writing Experience. DeBraun Thomas is a native of the San Francisco Bay Area and moved to Lexington in 2008. After graduating from the University of Kentucky in 2012, he began working as an intern at Lexington's NPR station WUKY and was brought on staff in 2013. History and storytelling are big passions of his and he was able to do both in producing The Unghosting of Medgar Evers (2012) and a documentary on the March on Frankfort (2013) for WUKY. DeBraun does a weekly feature on local musicians in Lexington called Local Music Monday and is also the host of the Crunkadelic Funk Show which airs Saturdays at 9pm on WUKY. Speaking out on social issues is something he's felt is his duty as a person of color. 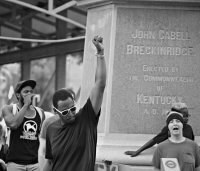 In 2016 DeBraun founded the Take Back Cheapside Movement, a coalition of various organizing groups with the goal of removing confederate statues located at Cheapside, the site of a former slave market in Lexington. In addition to producing radio features and organizing, DeBraun also spends his time writing and performing music. He released his first album, All My Colors Are Blind, in 2015 and continues to perform regionally with his band. DeBraun is looking forward to working with KFTC and gathering more tools to use in the fight against oppression.